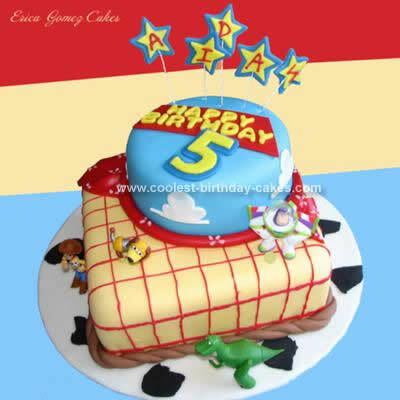 I thought I would show you the Homemade Toy Story Birthday Cake I made for my son’s 5th birthday, which was today. By no means is it ‘original’ in its concept, but I added a few personal touches (which I hadn’t seen) such as the bandana and the ‘cow-hide’ cake board. This tops my favorites. And it took me about 10 hours to complete from prep to baking time to finish. The cakes are both a chocolate mayonnaise cake with cookies-and-cream filling, dirty-iced in buttercream and covered in homemade, tinted marshmallow fondant, which is all I ever use now. I used the Wilton fondant writer in red to make the lines on the yellow ‘shirt’ (tricky). I cut out the stars in two shapes and arranged them with florist’s wire (doubled-up) and then piped on the letters of my son’s name in ‘ANDY’ style (with the backwards ‘N’). These added height and dimension to the finished cake. I also cut out ‘Happy Birthday’ in fondant and laid the letters on the red cut-out resembling the ‘Toy Story 3′ movie logo. Finally, as an added bonus I was able to find some small figurines which I added to the cake. 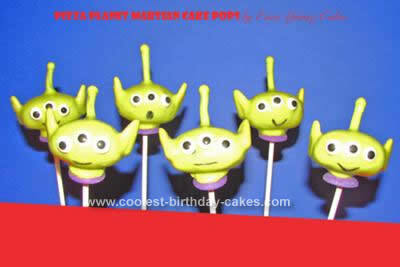 Oh, and I made cake pops for the loot bags, made to resemble the little green Pizza Planet martians! Birthday cake idea Posted by Erica G.
Love this! Awesome, AWESOME job.